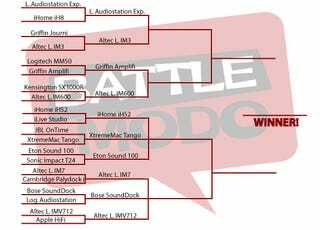 After the first round of our iPod Dock Bracket competition, here are the winners who will be moving on to fight another day. There were upsets, as I for one expected the AudioStation to beat the aging Bose system. And the Altec Lansing products have done extremely well thus—though they admittedly make a ton of docks, most of which we included. For a complete updates, hit up our bracket homepage. And don't forget to place your bets for round two in our comments.